Angiotensin-converting enzyme, or ACE, is a central component of the renin-angiotensin system (RAS), which controls blood pressure by regulating the volume of fluids in the body. ACE inhibitors are of medical use as treatment of cardiovascular diseases. The pathway is centred around angiotensinogen, its conversion to angiotensin I (Ang I) by renin and the subsequent conversion to angiotensin II (Ang II) by angiotensin converting enzyme1. Ang II activates the angiotensin II receptor type 1 (AGTR1) to induce aldosterone synthesis ultimately increasing blood pressure. 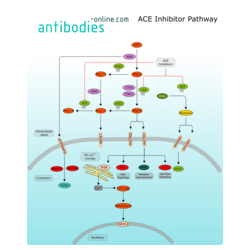 ACE, the angiotensin converting enzyme, is mainly tissue bound at the plasma membrane. ACE converts Angiotensin I by the removal of 2 amino acids to angiotensin II. ACE inhibitors target the ACE gene product resulting in downstream reduction of Ang II, therefore decreasing aldosterone secretion. The inhibitors increase bradykinin signaling inducing vasodilation with nitric oxide synthase 3 (NOS3) as well2. Along with ACE inhibitors, angiotensin receptor blockers (ARBs), which target AGTR1on cardiac and vascular cells, also resulting in lower levels of aldosterone and lower blood pressure. ARBs are selective for AGTR1 and do not bind to AGTR2. AGTR2 acts as a counterpart to AGTR1mediated signaling, diminishing potentially harmful effects3. 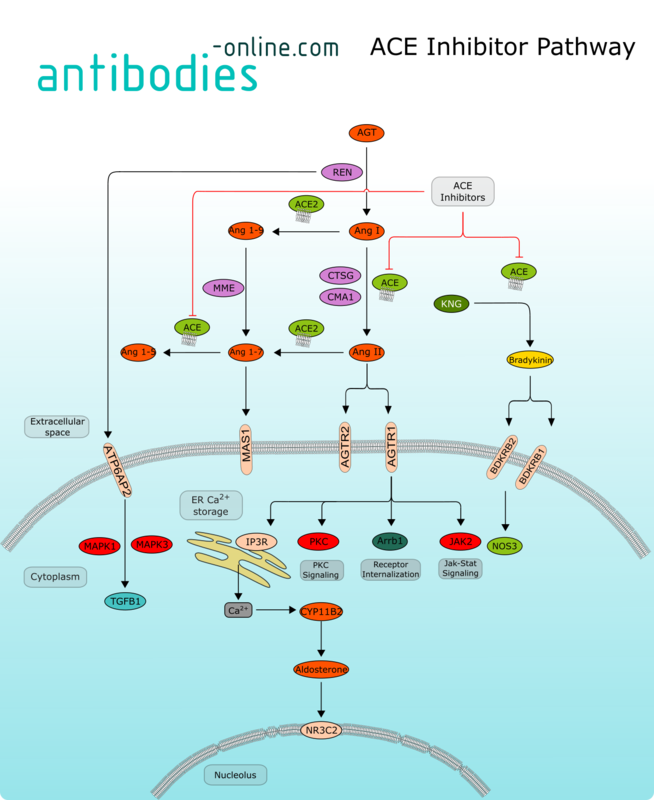 Angiotensin signaling downstream of AGTR1 can occur through several different pathways, as the receptor binds a variety of other proteins; not all functions for them in AgtII signaling via AGTR1 are yet discovered. Examples are the modulation of intracellular calcium, but also via 12-lipoxygenase, PKC and src kinase family routes.AGTR1 can interact with Jak2 thus prompting the Jak-Stat signaling. Downstream signalling is not fully pictured in this graphic. Atgr1, phosphorylated by PKC or specific GPCR kinases, binds beta-arrestin proteins (Arbb). This promotes receptor internalization or receptor recycling, leading to termination or stimulation of the signal, respectively. AGTR1 mediated signaling stimulates the synthesis of aldosterone and is the main reason for blood pressure decrease. Calcium stimulates calmodulin dependent protein kinase leading to phosphorylation of transcription factors with a role in aldosterone synthesis and release4. They promote enzymes like hydroxylase cytochrome P450 (CYP11B2) involved in aldosterone biosynthesis. Aldosterone itself binds to the mineralocorticoid receptor NR3C2 resulting in its translocation to the cell nucleus, homodimerization and binding to hormone response elements present in the promoter of genes, crucial for transepithelial sodium transport, like epithelial sodium channel (ENaC) or Na+/K+ pumps. This creates a concentration gradient which results in reabsorption of sodium (Na+) ions and water (which follows sodium) into the blood, and secreting potassium (K+) ions into the urine.